I started with some white paper, markers, crafts tape, scissors, ribbon, and white pom poms. After I cut the paper into fours, I folded them in half for 4 cards. I taped a piece of triangle onto the first card and continued with trapezoid shapes to make a tree. Then decorate as needed. I find that the more minimalistic it is, the more store bought it looks. Onto the second card, I taped two pieces of ribbon to the sides and twisted to create a bow effect. Tape down the ends and I’m done. For the next two cards, I wrote a message in the middle of the card and decorated with pom poms. 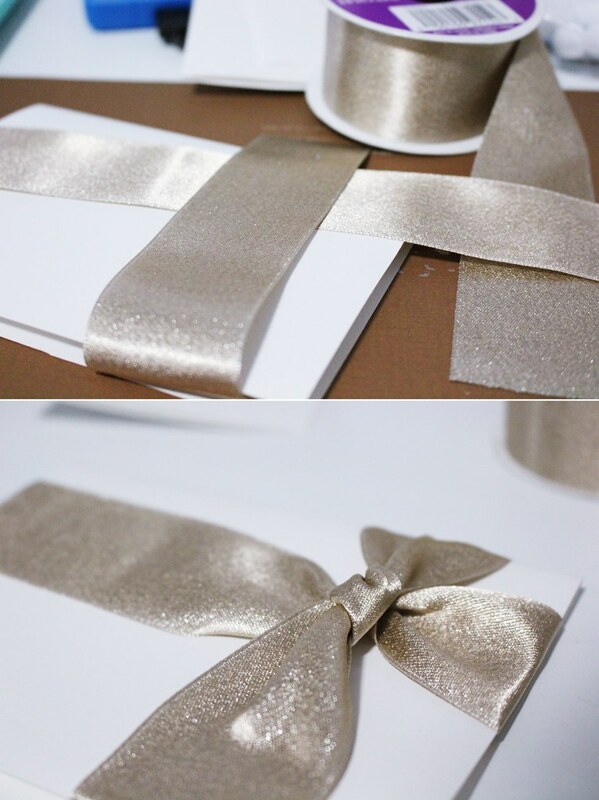 I didn’t have glitter so I cut pieces of the ribbon and glued them onto the card. Now that I have the cards, I just need to write in a simple message to include with the gift. These look fabulous Vicky. Very clever. Oooh loving all of these cards 😀 ❤ Hehehehe thank you so much for the snowball one! I really love it! I think creating your own cards add such a lovely (and personal) touch. It’s soooo much more appreciated than a store-bought card ❤ Great DIY, babe. Wow they’re so beautiful with a personal twist! Love the golden handwriting! And merry Christmas to you too! Your photos look amazing girl!! !